Our mission – making a better barbecue pit – is an engineering challenge. So why not jump in with some basic barbecue thermodynamics? 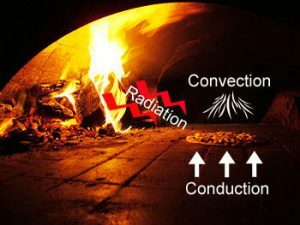 Radiation – where a hot object emits infrared energy that is absorbed by a cooler one (e.g., broiling). Radiation requires a clear line-of-sight from the heat source to the meat, and proximity is critical, as energy drops off rapidly with distance. Convection – where a fluid or gas is heated and carries the heat to the food (e.g., a deep fryer). Your kitchen oven (whether it’s a “convection oven” or not) moves heat via convection – the gas or electric element (at the bottom) heats air, which rises, cools as it gives its heat to the food, and sinks back down to be reheated. The medium can also transport moisture, flavors, etc. to and from your meat. 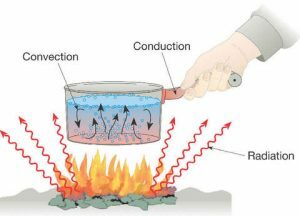 Conduction – where direct contact occurs between hot and cold objects (e.g., frying). Whether you’re broiling, baking, or frying, 99% of your meat’s volume – all but the outer surface – is being cooked by conduction from the outside inwards. The heat transfer mode only determines how the heat gets to the meat’s surface. As we’ll learn in How Meat Cooks, we’re raising the meat’s internal temperature way past “well-done” to break down the tough connective tissues into silky, flavorful gelatin. This denaturing takes time, and we have to do it without overheating any part of the meat. That requires low temperatures and no hot spots – impossible when frying and difficult when broiling without rotisseries, etc. So we use convection – we bake the meat – which also imparts aromatic flavors from the fire. A barbecue pit is just a wood-fired oven.